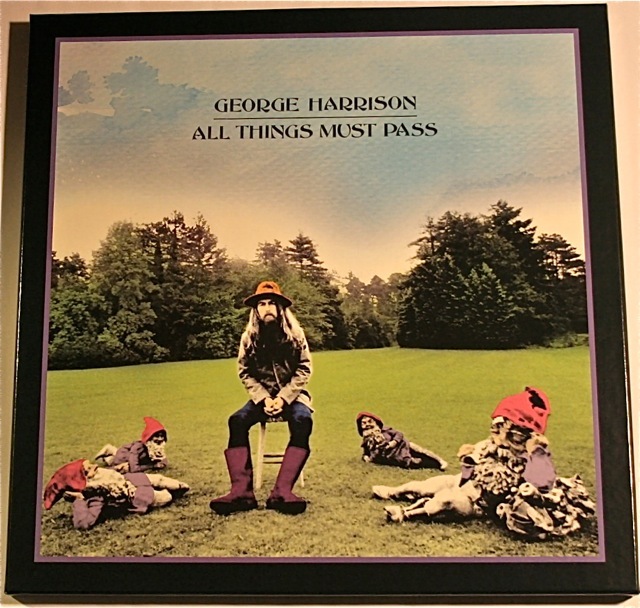 In November it will be 40 years since George Harrison released his masterpiece, “All Things Must Pass”. It was the first triple LP ever released by a solo artist. 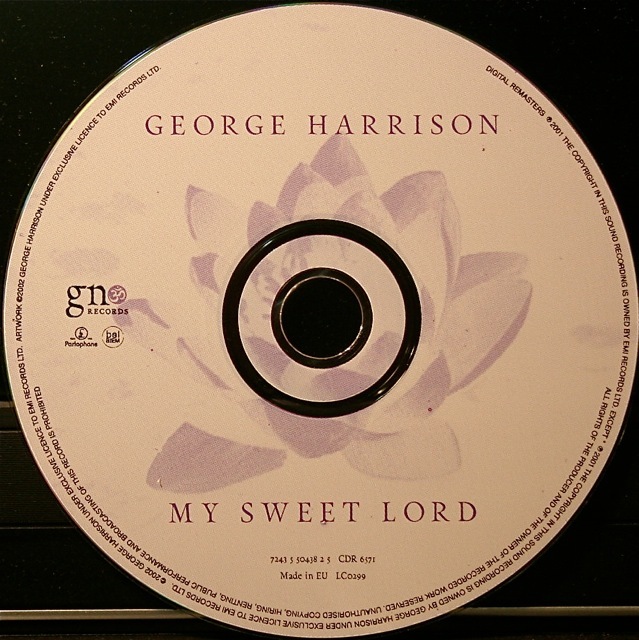 Harrison had so many songs – many of them stored up from his Beatles days – that they sprawled across 2 LPs, plus a third disc called “Apple Jam” which was just that: George and his mates jamming in the studio. 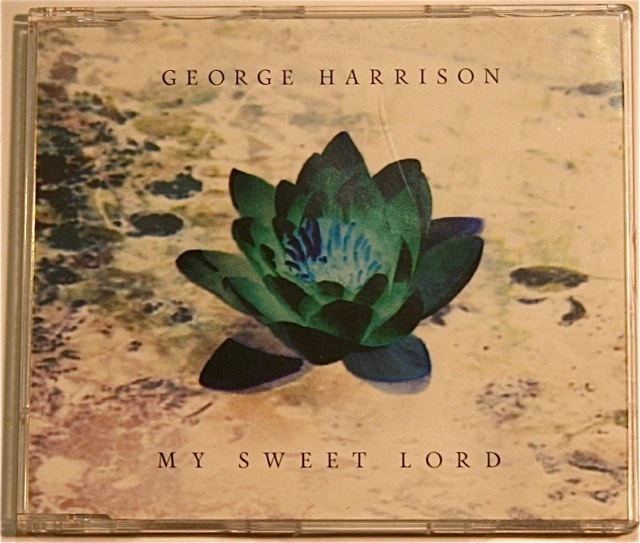 The box came with a huge poster of George (36″ x 24″), and each inner sleeve was in a different colour, complete with the printed lyrics to the songs it contained. Record one is in a light blue sleeve, record two is grey, and record three (“Apple Jam”) is mustard coloured. For further information see also the official All Things Must Pass website, and the excellent Beatles Recorded Sound Index entry. Don’t forget to check out this weird version of this album. Also this update on another US label variation in the collection. 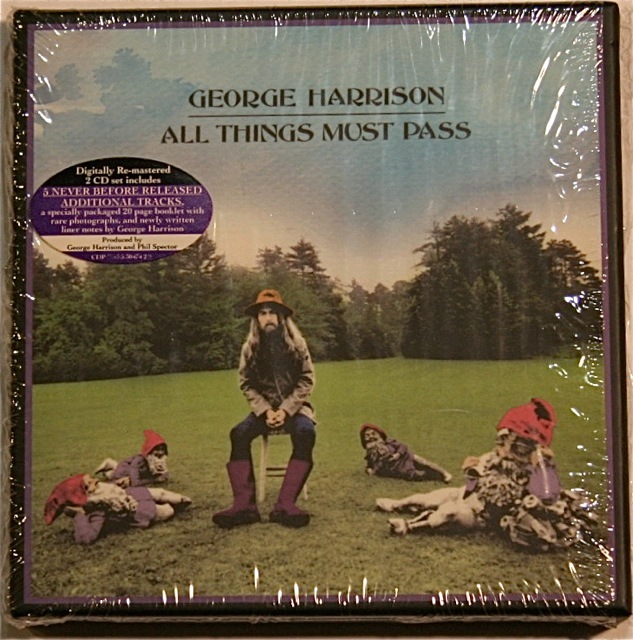 And click here for the Record Store Day 2010 limited edition of “All Things Must Pass”. 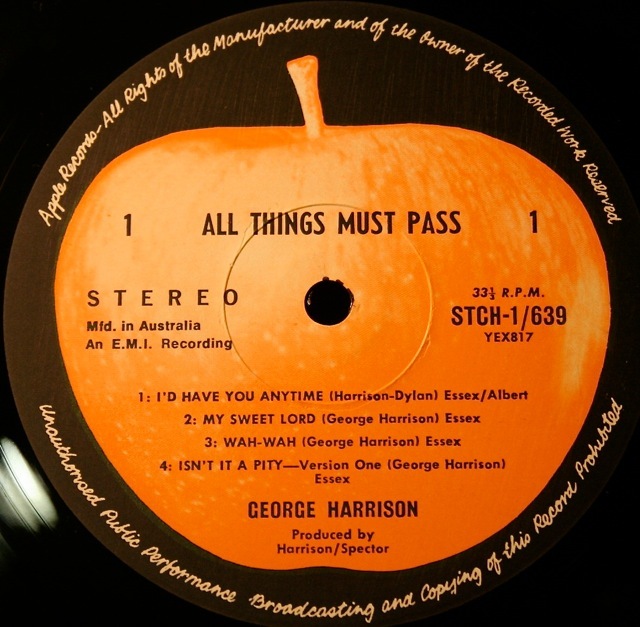 This entry was posted in Beatles, Beatles Collecting, Beatles Music, Beatles Related, George Harrison, Ringo Starr, Uncategorized and tagged All Things Must Pass, Apple Records, Beatles, Beatles Collecting, Beatles Related, George Harrison, My Sweet Lord, Rare Beatles by beatlesblogger. Bookmark the permalink. 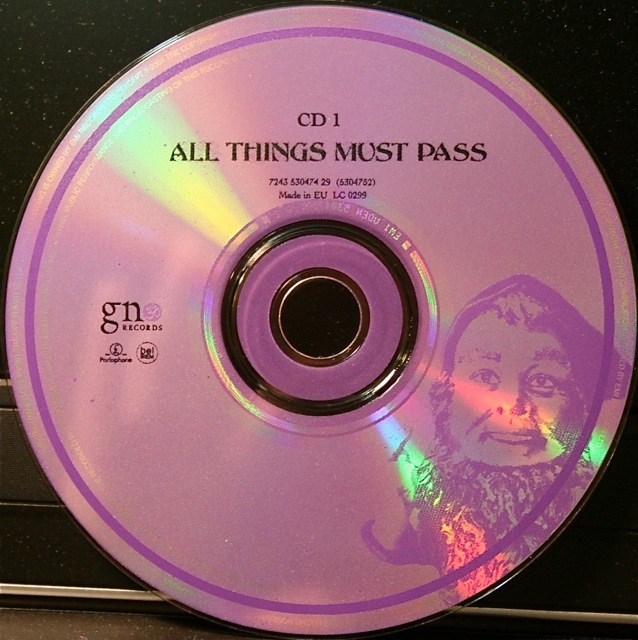 I just scored what I think might be an unopened original pressing of All Things Must Pass. 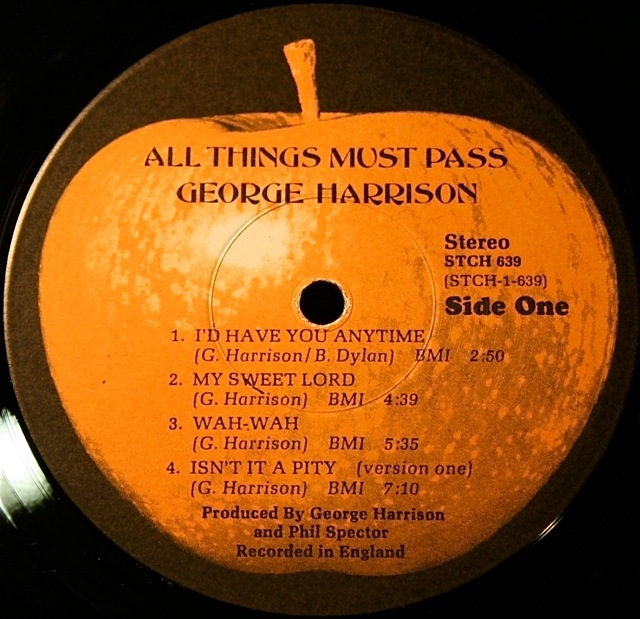 I removed the shrink wrap and found labels such as the first ones pictured on your webpage (under the text lines “The US and UK labels were Apple – but in this time in bright orange:” and “On the first two discs there was the full Apple on one side, and a cut Apple on the other:”). Are those pictures actual first-pressing labels? 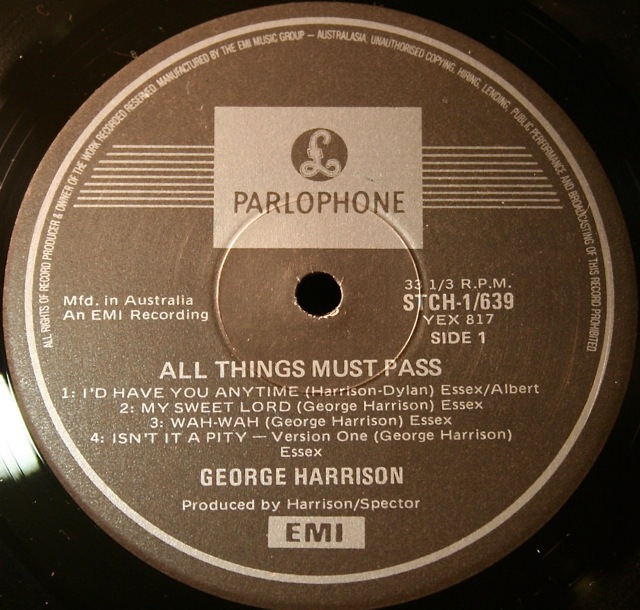 Hi Thomas, Yes – those are original 1970 labels from the US pressing of “All Things Must Pass”. Hope this helps. Sounds like you might have found a really nice original copy there! 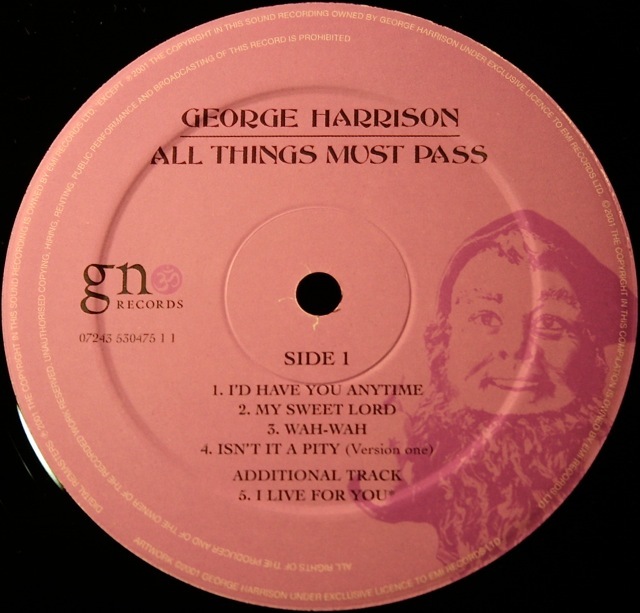 I have what appears to be an original test pressing of All Things Must Pass by GH. There is no art, no labels (there are white labels on the records but nothing printed) and nothing which specifies what the album is. It is, however, ATMP. I believe the dead wax is the same as the first pressing of ATMP however I do not have the first pressing (US). I bought it a few years ago from a friends father who was a massive vinyl collector. I can find 0 information about this and would appreciate any assistance on this. Yep – sounds like either a test pressing, or an advance pressing sent to radio stations to play to get early “word of mouth” publicity for the official release. A nice collectors item to have! Thanks! The labels match exactly, so I believe it’s a first pressing. How sweet it is! the box set pressing i have with the run-off groove numbers- 1U on all 6 sides and labels that say ‘mfd in the UK 1970’ comes in a usa box with orange inner, with a usa poster and usa inner sleeves, the strange thing is that sides 1.2,3 & 4 have the uncut, full Apple label like the Australian release instead of the cut apple on sides 2 & 4. My guess is that the Uk Lps were shipped over to America and packaged there using the usa box and inners? i cant come up with an answere as to why the 4 orange labels show the uncut apple? Any ideas? Hi, Yes I guess that could have been the case. Did you but the set new in the USA? Anyone else have any info on this one? labels, ‘mfd in uk 1970’ (sides 1,2,3 & 4 have the full uncut orange Apple label) sides 5 & 6 have the green labels. (side 1) YEX 817-1U, 1. O? (side 2) YEX 818-1U, 2. O? (side 4) YEX 820-1U, 2. ?? (side 6) YEX 822-1U, 1. GL. There seems to be quite a few variations on this box set although ive not come across another copy that has the 4 full Apple labels on sides 1,2,3 & 4? others ive seen have the cut Apple on sides 2 & 4. I was checking my ATMP UK lp and my lps say IU on all sides, full apple, mfg in Uk, inner cover is orange with made and printed in Great Britain with card board separating between lp and inner end of box. Also my poster on the corner says made Printed in Gret Britain. I’m sure this is the first pressing. Any thoughts!!! 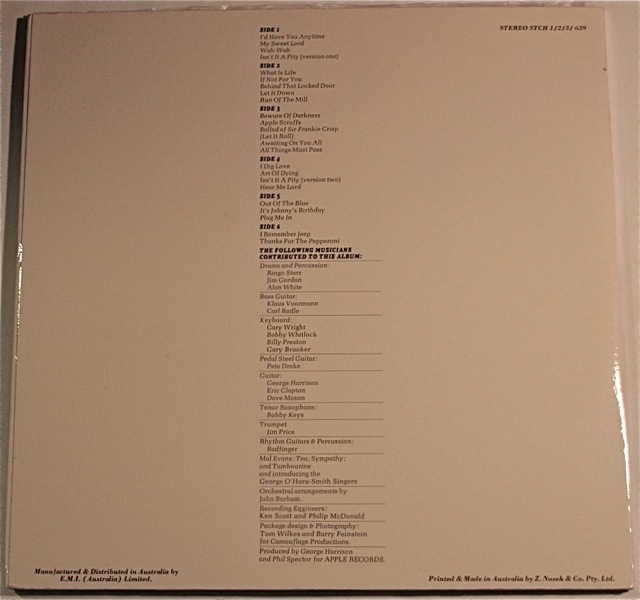 While looking at ATMP lp UK I noticed Eric Clapton not mentioned on inside cover. The two US versions I have, he’s listed on one of them but not the other. Interesting! hi, my copy also has the uncut apples. i have a first uk variation 1st mother stamper indicated by a 1 at 9 oclock and the letters AL stamped on run out, indicating 38th press from the first mother. Around 500 LPs pressed per letter. this can be indicated by using the GRAMOPHLTD coding. G being first 500, A being 3rd 500, GR being 12th, etc, etc. First press is sometimes confused with 1st mother stamper. You may have a first mother stamper but the press might be in the hundreds. A true first press i.e 1 mother and G stamp would indicate one of the very first 500 pressed. Hope that all makes sense and helps!! 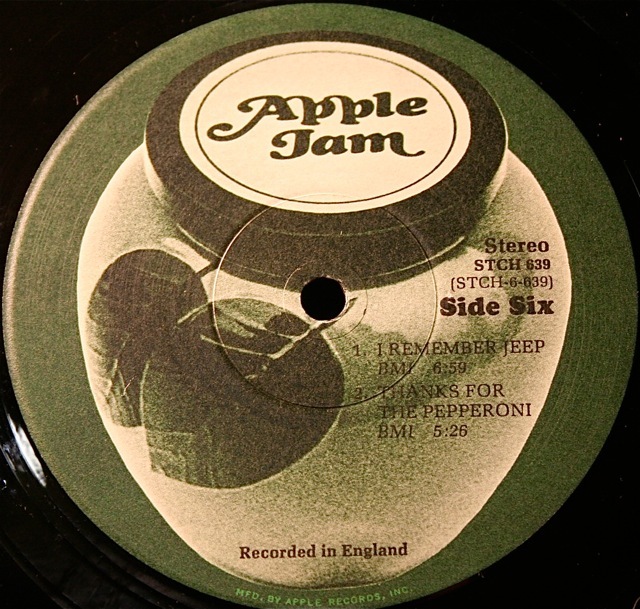 Hi, I’ve just received a copy of ATMP, it’s in a triple gatefold, UK version, on red apple with cut apples on sides 2 & 4, includes the green jam labels on sides 5 & 6. 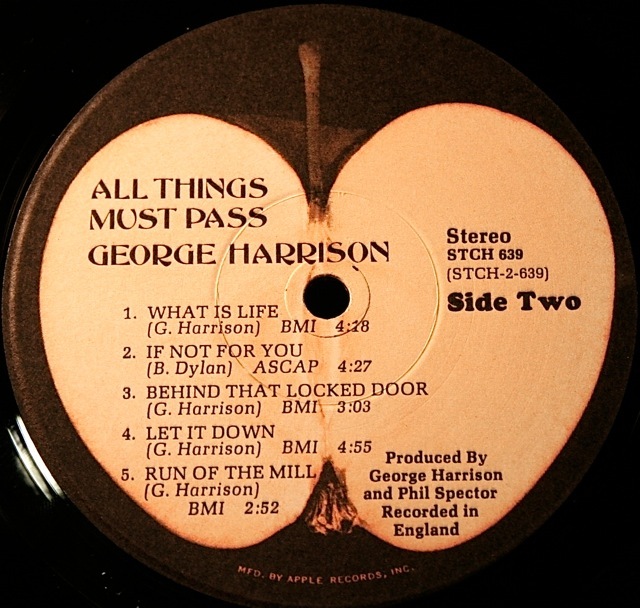 The back sleeve is pure black with a WHITE Apple logo in the middle with text stating: “2 George Harrison LP’s Plus 1 Apple Jam Session. 3 LP’s For The Price Of 2. Apple STCH 639”. This inside has the lyrics on the colours of the inner sleeves. It’s a top-loading sleeve. I have the Australian triple gatefold and it is different to this. Do you have any further info on this copy? I am thinking it was a later (poss. late 70s?) cheaper issue, without the inclusion of the box. Any info would be greatly appreciated! Let me know if this is what you have got. Cheers. I have this exact copy! Have no idea how to price it and want to sell, any ideas? Hi – which one on the page do you have? Thanks. OK, So, if you have a good copy of the South East Asian release then I’d think it would easily be worth between $70-$100 Australian, depending on condition. Thanks! It’s in really good condition so will put it on eBay and see how I go. The south East Asian version. Sorry south East Asian version. That’s the one. We lived in Hong Kong from 1970 to 1972 so it was most likely bought there by Dad. Hi, I’ve just received a copy of ATMP, it’s in a triple gatefold, UK version, on red apple with cut apples on sides 2 & 4, includes the green jam labels on sides 5 & 6. 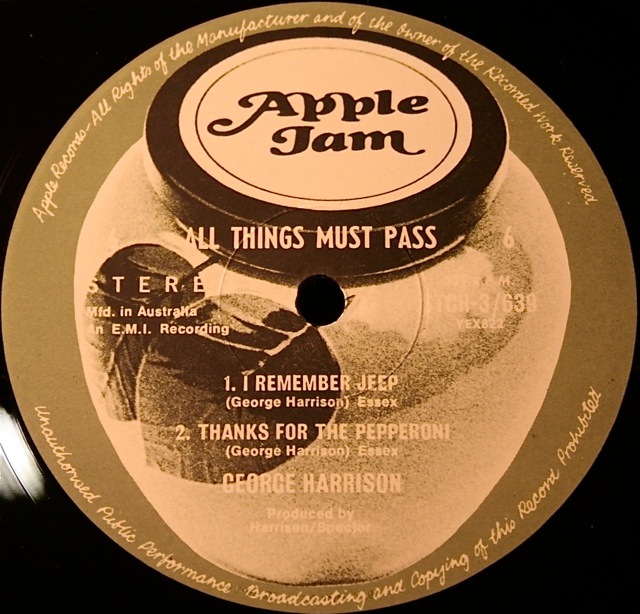 The back sleeve is pure black with a WHITE Apple logo in the middle with text stating: “2 George Harrison LP’s Plus 1 Apple Jam Session. 3 LP’s For The Price Of 2. Apple STCH 639″. This inside has the lyrics on the colours of the inner sleeves. It’s a top-loading sleeve. 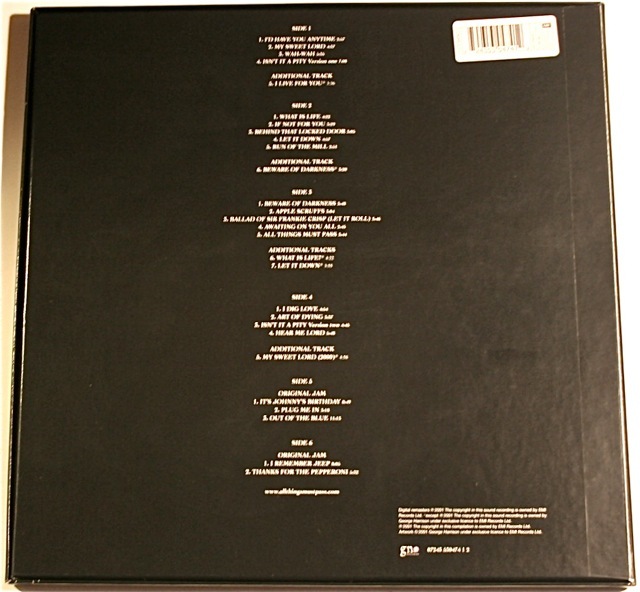 I have the Australian triple gatefold and it is different to this. Do you have any further info on this copy? I am thinking it was a later (poss. late 70s?) cheaper issue, without the inclusion of the box. Any info would be greatly appreciated! Hi Adrian, this is a new one on me and sounds very unusual and interesting. Does anyone else out there have any info? Please contribute to the discussion. Adrian – can you send me a couple of photos please? Many thanks for your info on this. Yes, it does look exactly like the copy I have got. South East Asian copy, wow, very surprised by this. That’s a really great site on apple records. Many thanks for all your help on this. Fantastic info! Yes, that is the one! It’s the south-east Asian copy, it’s really nice, I love it! Thanks to all of you for your massive, massive help!! I have four of the ATMP 3-D lenticular covers. Would anyone have any idea how many are out there? Recently I bought the original neg used on the ‘Apple Jam’ cover. Would anyone have additional info on other ATMP artwork or negatives? 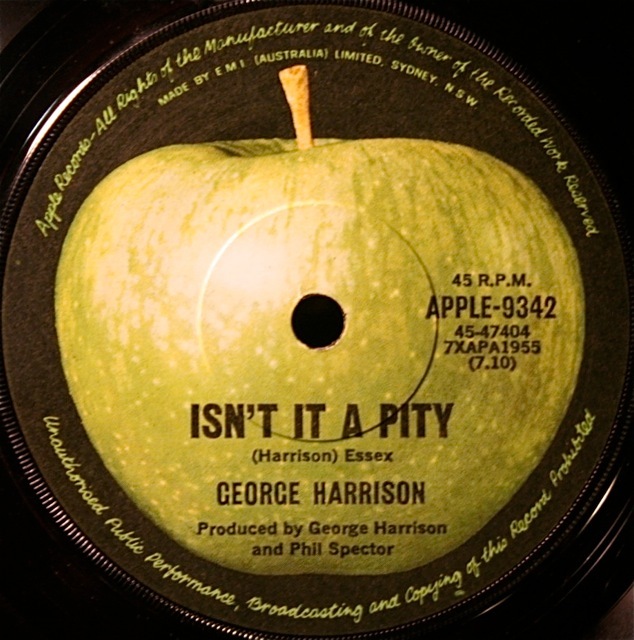 Pingback: Isn’t it a pity… remember George Harrison… | U riep, meester? I found a used US copy of ATMP at a local record store and the inner sleeves are lilac, gray and mustard, and they have the “printed in USA” stamp in the corners. But they appear slightly different from any other versions of the sleeves I have seen online. None of the titles have an asterisk next to them and there is no copyright information after the lyrics on Side 4 or Side 2, which seems to be on every other copy I see. Any clue where these sleeves came from? I’m still trying to determine if the box and records are original or from the recent reissue. If it helps the Apple address is on the Apple Jam sleeve and not on the inner lid. Thank you! 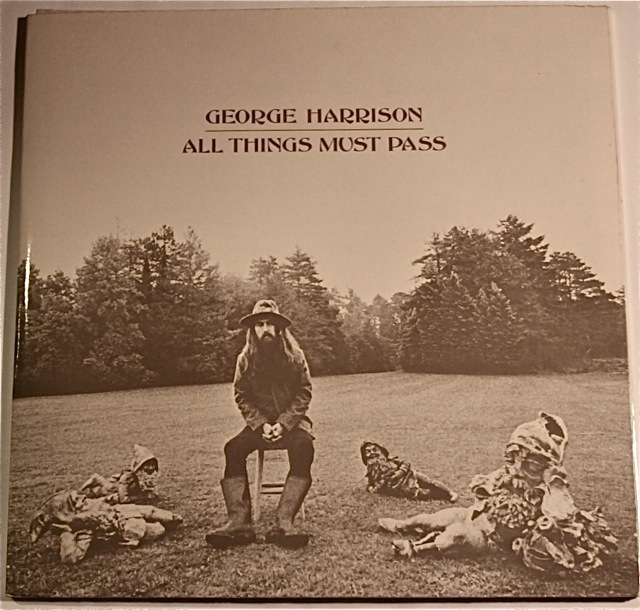 Dear sir can you tell me the value if any of an all things must pass lyric book it has some stains on the outside cover but given the age i would say fairly good condition,thank you for your time and any information you can provide me. If it has stains on the cover it is probably worth in the region of $10. I have an unusual pressing of this. 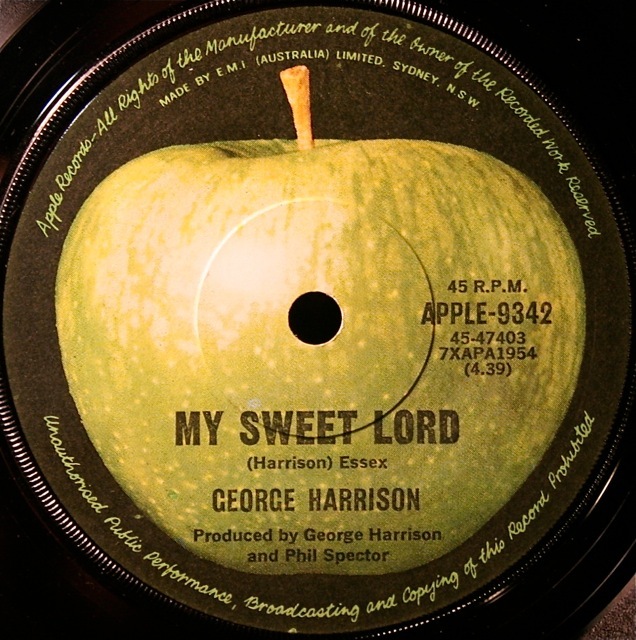 Firstly LP 1 has the orange apple sie 1 with the cut apple side 2.
i have an unusual pressing of this. LP 1 has the orange apple / sliced apple yet LPs 2 & 3 are both on the Apple Jam Labels. The LPs are in black and white pic sleeves showing available albums and LP 1 states made In India by The Gramophone Co Of India Ltd. This is also stated on the inner sleeves. So I have one orange apple LP and 2 Apple Jam LPs ( All track listings are correct.